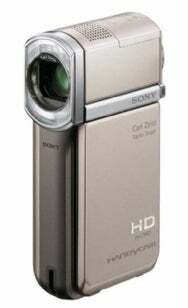 Sony on Thursday announced the HDR-TG5V, a high-definition (HD) camcorder that is equipped with a GPS receiver and can geotag recorded videos and still photos. With the HDR-TG5V’s GPS receiver, as well as built in support for Navteq digital maps, Sony says that location data can be added to recorded files. You can view maps on the camcorder’s 2.7-inch LCD as well as find geotagged locations on the map. Sony includes PC software that Windows users can use to via geotag information on a map; for Mac users, the geotags can use by iPhoto ’09’s Places feature. Using a 1/5-inch Exmor CMOS sensor, the HDR-TG5V records AVCHD video at 1,920-by-1,080 resolution and 4-megapixel still photos. The camcorder has 16GB of built-in memory, enough room for 110 minutes of video at the highest quality setting. There’s also a slot for Memory Stick Pro Duo cards to increase the storage capacity. The camcorder includes features such as face detection, smile shutter, built-in flash, 10X optical zoom, Dolby Digital stereo recording with a built-in zoom microphone, a super slow motion recording mode, image stabilization, HDMI and USB 2.0 ports, and a rechargeable battery. The HDR-TG5V will be available in May for $1,000.